Arterial stiffness represents a key factor in cardiovascular disease and pulse wave velocity (PWV) can be considered as a surrogate index for arterial stiffness. This protocol describes an image processing algorithm for calculating PWV in mice based on ultrasound image processing that is applicable at different arterial sites. Di Lascio, N., Kusmic, C., Stea, F., Faita, F. Ultrasound-based Pulse Wave Velocity Evaluation in Mice. J. Vis. Exp. (120), e54362, doi:10.3791/54362 (2017). Arterial stiffness can be evaluated by calculating pulse wave velocity (PWV), i.e., the speed with which the pulse wave travels in a conduit vessel. This parameter is being increasingly investigated in small rodent models in which it is used for assessing alterations in vascular function related to particular genotypes/treatments or for characterizing cardiovascular disease progression. This protocol describes an image processing algorithm which leads to non-invasive arterial PWV measurement in mice using ultrasound (US) images only. The proposed technique has been used to assess abdominal aorta PWV in mice and evaluate its age-associated changes. Abdominal aorta US scans are obtained from mice under gaseous anesthesia using a specific US device equipped with high-frequency US probes. B-mode and Pulse-Wave Doppler (PW-Doppler) images are analyzed in order to obtain diameter and mean velocity instantaneous values, respectively. For this purpose, edge detection and contour tracking techniques are employed. The single-beat mean diameter and velocity waveforms are time aligned and combined in order to achieve the diameter-velocity (lnD-V) loop. PWV values are obtained from the slope of the linear part of the loop, which corresponds to the early systolic phase. With the present approach, anatomical and functional information about the mouse abdominal aorta can be non-invasively achieved. Requiring the processing of US images only, it may represent a useful tool for the non-invasive characterization of different arterial sites in the mouse in terms of elastic properties. The application of the present technique can be easily extended to other vascular districts, such as the carotid artery, thus providing the possibility to obtain a multi-site arterial stiffness assessment. Mouse models are increasingly employed for the investigation of cardiovascular disease (CVD) and particularly used in longitudinal studies which allow the characterization of different phases of disease development1. Elastic properties of large arteries are related to different pathological conditions; from a technical point of view, arterial stiffness can be assessed by measuring pulse wave velocity (PWV), which represents the speed with which the pulse wave travels in a conduit vessel2. Because of its clinical significance, it is increasingly measured even in preclinical small animal models3. Different techniques are available for assessing PWV in mice. Invasive approaches are based on the use of catheter-tip pressure transducers. PWV is assessed by acquiring pressure signals at two different arterial sites and dividing the distance between the two measurement sites by the time shift between the signals4. The main disadvantage related to these kinds of techniques is that they require animal sacrifice for the evaluation of the distance between the two measurement sites and, thus, cannot be used in longitudinal studies. To overcome this limitation, non-invasive approaches, based on different imaging techniques, have been developed. Previous studies have reported PWV assessments in mice obtained by applying the transit time method on velocity-encoded magnetic resonance imaging data5 and Pulsed-Doppler signals6. However, the PWV value obtained with these methods is a regional evaluation of arterial stiffness. In fact, it represents an average value, accounting for different arteries in terms of size and elastic properties. In addition, these kinds of evaluations require the assessment of the distance between the two measurements sites which is a source of error that could influence the final result. PWV can be assessed using the diameter-velocity (lnD-V) loop7. This method is based on the simultaneous evaluation of diameter and flow velocity values in a selected vessel. According to this approach, the lnD-V loop is obtained by plotting natural logarithm diameter values vs mean velocity values and PWV is estimated by calculating the slope of the linear part of the obtained loop corresponding to the early systolic phase. With regard to the practical implementation of this method, previous works have already reported results about its application in an in vitro set-up system7 and its use for the assessment of both carotid and femoral PWV in humans8. The principal aim of the present study is to provide a detailed description of an image processing algorithm that provides a non-invasive arterial PWV measurement in mice using US images only. The proposed approach allows the evaluation of local arterial stiffness by means of the processing of both B-mode and Pulsed-Wave Doppler (PW-Doppler) images and can be applied on arteries of key importance, such as the abdominal aorta. Animal experiments were performed in accordance with the European Directive (2010/63/UE) and the Italian law (D.Lvo 26/2014), and it followed principles of laboratory animal care. The Local Ethical Approval Panel approved the study. Place the mouse in an anesthesia induction chamber filled with 2.5% isoflurane in 1 L/min pure oxygen. Verify the depth of anesthesia by unresponsiveness to toe pinch. Place the animal on a temperature controlled board in a supine position. Moisten the animal's eyes with eye salve, in order to avoid them running dry. Supply anesthetic gas flow (1.5% isoflurane) by placing the mouse's nose in the dedicated nose cone. If necessary, adjust the percentage of isoflurane from case to case, depending on the animal under study. Fix the board temperature at 40 °C. Coat the four limbs of the animal with conductive paste and tape them on the ECG electrodes embedded in the board. Measure body temperature with a rectal probe lubricated with petroleum jelly. Check that all the physiological measurements (ECG and respiration signal as well as temperature) are correctly acquired and displayed. Remove hair chemically from the abdomen with depilatory cream and coat it with acoustic coupling gel. Place the (13-24 MHz) US probe in the mechanical arm. Fix the US probe parallel to the animal and adjust its position in order to obtain longitudinal images of the abdominal aorta with the region of interest located in the focal zone. Click on the button allowing the high frame rate ECG-gated acquisition9, choose a frame rate acquisition equal to 700 fps and start the acquisition. Note: In this way anatomical images of the vessel related to a single cardiac cycle can be acquired. Using the same scan projection, click on the PW-Doppler button, place the sample volume in the centre of the vessel and acquire images ensuring that the cine loop is not shorter than 3 s. Obtain these data maintaining the angle correction as small as possible, adjusting it from case to case on the basis of the US projection obtained. Remove the animal from the temperature controlled board and wait for complete recovery. NOTE: In our experience this takes about 10 min. Do not leave and animal unattended until it has regained sufficient consciousness to maintain sternal recumbency. Export B-mode and PW-Doppler images as DICOM files and save them on a personal computer. Transform PW-Doppler DICOM files to .tiff images. Import the corresponding DICOM file using the dedicated Graphical User Interface (GUI). To initialize contours, draw a line close to the far wall of the vessel (single click for starting it and double click for ending it) and double-click close to the near wall. A line parallel to that close to the far wall will appear automatically. Apply the algorithm on a single frame by pressing the "ANALYSE" button. Check the result. If the edges have been correctly identified (i.e., the evolution of the initialized points have detected both the posterior and the anterior wall), apply the algorithm on the whole cine-loop by clicking on the "GO" button. If the edges are not correctly identified, clear them by clicking on "Clear Contour" and initialize them again by repeating point 2.2.2. NOTE: The algorithm is based on edge detection and contour tracking techniques and has been previously described in detail10. Obtain the final result by pressing on the "RECORD" button and save the corresponding .mat file which contains instantaneous diameter values related to a single cardiac cycle. Open the GUI for the lnD-V loop implementation. Click on the "VELOCITY" button in order to start PW-Doppler image processing which leads to a single-beat mean velocity curve. Identify the PW-Doppler trace and locate the line corresponding to a velocity value equal to zero by pressing the "WHITE LINE" button. Perform velocity calibration and time calibration by using the "VELOCITY" and "TIME" buttons (in the Calibration panel), respectively. Pressing on these buttons allows one to draw a line whose length corresponds to the calibration factor inserted. Manually select a ROI containing the physiological signals by using the "ROI PHYSIO" button. Manually select a ROI containing the PW-Doppler trace by pressing the "ROI SIGNAL" button. Click on the "ANALYSE" button and check if the envelope is identified. If the result is not satisfactory, change the threshold (by typing the new value in the "Velocity Threshold" editable text field) and press the "ANALYSE" button again. Tune the threshold from case to case, depending on the quality of the images. Press the "ELABORATION" button. Locate the R-peaks of the ECG signal and divide the velocity envelope signal accordingly by clicking the "UPDATE" button. Choose beats that are not corrupted by noise or located in the inspiration phase by clicking on the "CHOOSE BEATS" button. In this way, obtain a single-beat mean velocity waveform. Use the Fast Fourier Transform method to interpolate the selected beats in the frequency domain and make them all composed of the same number of points, as detailed in reference11. Perform this operation automatically by simply pressing the return key on the PC keyboard once the beats have been selected. If the "MEAN VELOCITY" checkbox is checked the single beat mean velocity signal is achieved by dividing the maximum velocity curve by two, hypothesizing a parabolic velocity profile12. Press the "OK" button. Click on the "DIAMETER" button. Interpolate the single-beat diameter waveform in the time domain in order to obtain a single-beat diameter signal with the same sample frequency as the single-beat velocity signal by pressing the "INTERPOLATE" button. Click on the "OK" button. NOTE: In order to have the single-beat diameter and mean velocity curves with the same sample frequency and the same number of data points, they are interpolated in the frequency domain. Select the "Second derivative" approach as the alignment method (above the graph displaying the diameter and velocity waveforms) and click on the "UPDATE" button. The two curves will be automatically time-aligned using the second derivative method14. Build the final lnD-V loop by plotting the natural logarithm of the single-beat diameter values against the single-beat mean velocity values. This is automatically done when the two waveforms are aligned. Note: The points included between the 5% and the 90% of the maximum value of the single-beat mean velocity curve are automatically located and a linear interpolation on these points is applied to evaluate the slope of the linear part of the loop. The proposed approach has been applied to mice abdominal aorta in a previous study11. The following figures show the results of the application of the described approach on real mice images. These data are from a single animal (wild type mice, 13 weeks old, strain: C57BL6, weight: 33 g) In particular, Figure 1 represents the result of the analysis of the US images. Edge detection and contour tracking techniques applied to B-mode images acquired with the high frame rate ECG-gated modality provide the diameter waveform; on the other hand, the identification of the PW-Doppler signal envelope leads to the single-beat mean velocity curve assessment. The evaluation of the single-beat mean velocity waveforms includes the average of data from different cardiac cycles. For the data shown, the standard deviation of the velocity curves (calculated as the average of the standard deviation obtained at each time point) is 0.0137 m/sec. Single-beat diameter and mean velocity waveforms are interpolated in both the frequency and time domain and then time aligned (Figure 2A). The lnD-V loop is obtained by plotting the natural logarithm diameter values vs. the mean velocity measurements, as shown in Figure 2B. PWV is assessed by calculating the slope of the linear part of the loop, which is known to correspond to the early systolic phase. This portion is automatically identified as that corresponding to the upslope of the mean velocity curve. These figures indicate that the image processing operations required for the implementation of the proposed technique leads to a final lnD-V loop which is similar to that obtained in humans using a similar approach7. This suggests that this technique could represent a valid alternative for non-invasive PWV assessment in mice. Figure 1: Processing of B-mode and PW-Doppler Images. B-Mode images (a) are processed using edge detection and contour tracking techniques. PW-Doppler images (b) are processed for the identification of the envelope signal from which the single-beat mean velocity waveform is obtained. Please click here to view a larger version of this figure. Figure 2: Implementation of lnD-V Loop for PWV Calculation. Diameter and mean velocity waveforms obtained from B-mode and PW-Doppler image processing. (a). The lnD-V loop is obtained by plotting the natural logarithm of the diameter values against the mean velocity values (b). Please click here to view a larger version of this figure. In this study, an image processing algorithm based on the lnD-V loop for PWV assessment in mice has been described in detail. The proposed approach is based on the processing of US images only and, thus, could represent a valid alternative to existing techniques6,13 for the evaluation of arterial stiffness in mouse models. In fact, conversely to invasive methods6 which are based on the acquisition of intra-arterial pressure signals and require the animal to be sacrificed, this technique is completely non-invasive and, thus, can be particularly suitable in the case of longitudinal studies. In addition, it provides an evaluation of arterial stiffness which is local and not regional. Although the proposed method is known to be influenced by the reflected wave15, it may provide a more precise PWV assessment with respect to other US-based approaches for local PWV assessment, such as that based on the flow-area technique13 which requires the acquisition of color-flow data in cross-sectional projection. The PWV value shown in the "Representative Results" section, equal to 1.69 m/sec, is in line with what is reported in reference11: in fact, in this study, abdominal aorta PWV was equal to 1.91 ±0.44 m/sec in adult mice and 2.71 ±0.63 m/sec in old animals. In order to minimize errors in PWV assessments, great attention has to be paid when acquiring US images. In particular, B-mode images should be acquired with very clear anterior and posterior walls in order to achieve a diameter curve which is not corrupted by noise. With regard to PW-Doppler images, the angle correction should be minimized. The value of 60 degrees may represent, in most of cases, a good compromise between a good long axis view and a good approximation of velocity components. Furthermore, in the case of longitudinal studies with repeated measurements, care should be taken in imaging the vessel in the same manner, i.e., with the same scan projection. The main limitation of the presented approach concerns the fact that the images required for the diameter and mean velocity waveform assessments are not acquired simultaneously. This lack of simultaneity can represent a source of error for PWV assessment and make the measurement less precise. In addition, a real simultaneous acquisition would guarantee a better time alignment between the two curves and avoid problems linked to heart rate variability. From a practical point of view, another limitation could be the lack of availability of the high frame rate ECG-gated modality. This problem can be partially overcome by acquiring images in B-mode modality and adjusting the acquisition parameters in order to achieve the highest temporal resolution. In this case, the diameter signal should be divided by the ECG base and processed in the same manner as the velocity signal, in order to obtain a single beat diameter waveform. However, in some conditions, the obtained temporal resolution will not be appropriate to achieve a valid diameter signal. Future modifications of the image processing chain aimed to overcome these limitations would improve the technique and lead to a more precise assessment of local arterial stiffness. Future applications of the presented approach would concern other arterial districts. Effectively, thanks to the fact that it requires the acquisition of B-mode and PW-Doppler images only, this method can be easily applied to other arterial sites, such as the carotid artery, thus providing a multi-site arterial stiffness assessment. A higher frequency probe should be chosen for more superficial arteries such as the common carotid; in any case, the choice of the probe should ensure the correct visualization of the artery for the animals in the study. In conclusion, the described system might offer a simple way to assess functional properties of different arteries in mouse models. Zaragoza, C., et al. Animal Models of Cardiovascular Diseases. J Biomed Biotechnol. 2011, 497-841 (2011). Laurent, S., et al. Expert consensus document on arterial stiffness: methodological issues and clinical applications. Eur Heart J. 27, 2588-2605 (2006). Wang, Y. X., et al. 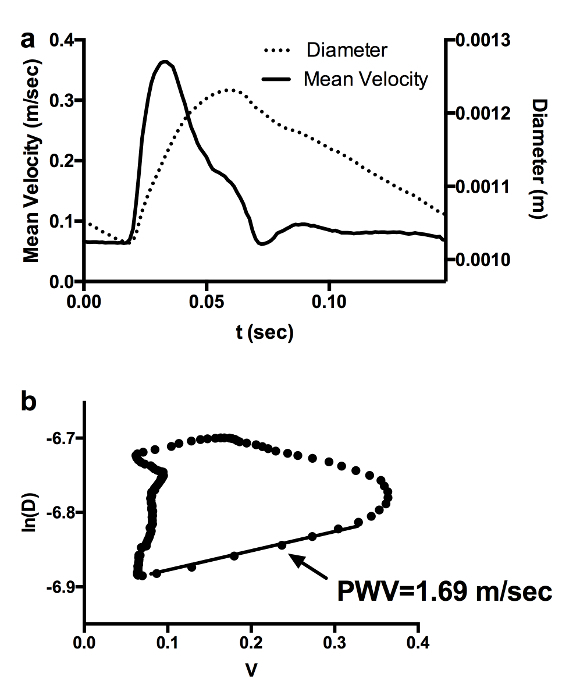 Increased aortic stiffness assessed by pulse wave velocity in apolipoprotein E-deficient mice. Am. J. Physiol. Heart Circ. Physiol. 278, 428-434 (2000). Mitchell, G. F., Pfeffer, M. A., Finn, P. V., Pfeffer, J. M. Comparison of techniques for measuring pulse-wave velocity in the rat. J Appl Physiol. 82, (1), 203-210 (1997). Parczyk, M., Herold, V., Klug, G., Bauer, W. R., Rommel, E., Jakob, P. M. Regional in vivo transit time measurements of aortic pulse wave velocity in mice with high-field CMR at 17.6 Tesla. J Cardiovasc Magn Reson. 12, 72 (2010). Hartley, C. J., Taffet, G. E., Michael, L. H., Pham, T. T., Entman, M. L. Noninvasive determination of pulse-wave velocity in mice. Am J Physiol. 273, (1), Pt 2 494-500 (1997). Feng, J., Khir, A. W. Determination of wave speed and wave separation in the arteries using diameter and velocity. J Biomech. 43, (3), 455-462 (2010). Borlotti, A., Khir, A. W., Rietzschel, E. R., De Buyzere, M. L., Vermeersch, S., Segers, P. Noninvasive determination of local pulse wave velocity and wave intensity: changes with age and gender in the carotid and femoral arteries of healthy human. J Appl Physiol. 113, (5), 727-735 (2012). Chérin, E., et al. Ultrahigh frame rate retrospective ultrasound microimaging and blood flow visualization in mice in vivo. Ultrasound Med Biol. 32, (5), 683-691 (2006). 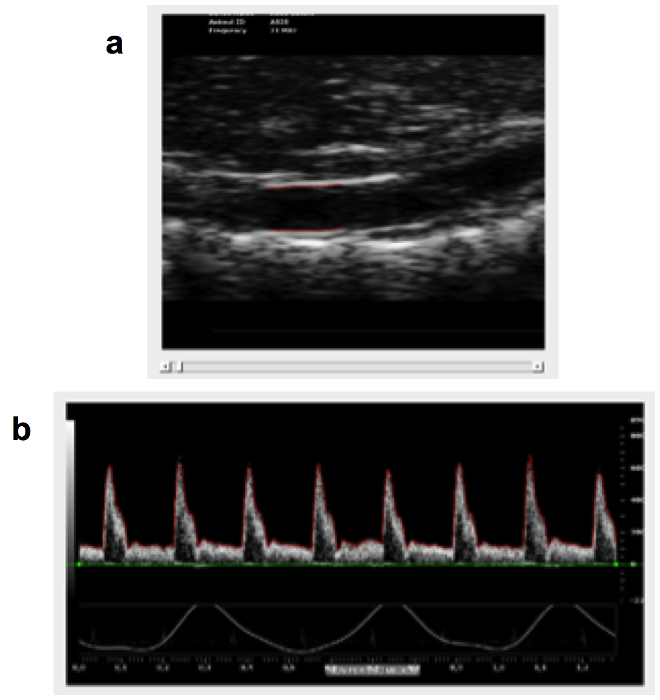 Gemignani, V., Faita, F., Ghiadoni, L., Poggianti, E., Demi, M. A system for real-time measurement of the brachial artery diameter in B-mode ultrasound images. IEEE Trans Med Imaging. 26, (3), 393-404 (2006). Di Lascio, N., Stea, F., Kusmic, C., Sicari, R., Faita, F. Non-invasive assessment of pulse wave velocity in mice by means of ultrasound images. Atherosclerosis. 237, (1), 31-37 (2014). Nichols, W. W., O'Rourke, M. F. McDonald's Blood Flow in Arteries: Theoretical, Experimental, and Clinical Principles. Arnold. London. 215-358 (1998). Williams, R., et al. Noninvasive ultrasonic measurement of regional and local pulse wave velocity in mice. Ultrasound Med Biol. 33, (9), 1368-1375 (2007). Penny, D. J., et al. Aortic wave intensity of ventricular-vascular interaction during incremental dobutamine infusion in adult sheep. Am J Physiol Heart Circ Physiol. 294, 481-489 (2008). Segers, P., et al. Wave reflection leads to over- and underestimation of local wave speed by the PU- and QA-loop methods: theoretical basis and solution to the problem. Physiol Meas. 35, (5), 847-861 (2014).